Paraphytomyza populi (Kaltenbach, 1864); Spencer, 1976. Fauna ent. Scand. 5(1): 320-1, figs 576-8. Paraphytomyza populi (Kaltenbach, 1864); Spencer, 1990. Host specialization in the world Agromyzidae (Diptera) : 81, 93. Leaf-mine: A long winding, whitish linear mine, initially lower surface, later upper surface. Pupation takes place within the leaf, in a distinct puparial blister, the anterior spiracles projecting through the epidermis (Spencer, 1976: 320-1, fig. 578). Yellowish, tortuous corridor with the sides very untidily eaten out. The mine frequently starts at the lower surface, mostly, but by no means always, turning upper-surface later on. Frass in isolated grains, irregularly distributed at either side of the corridor. Puparium brown, in a widened puparial chamber in the mine; near the frontal end of the puparium the epidermis is already more or less torn open (Bladmineerders van Europa). A long winding white gallery (as shown), starting lower side, shallow and going upper side, broad. The mines may not be upper surface and in some cases may be totally lower surface. There may be several mines in a leaf (British leafminers). The larva is described by (Skuhravá and Roques, 2000) and illustrated in Bladmineerders van Europa. 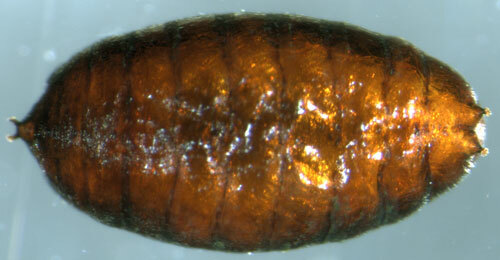 Dark brown; posterior spiracles each having an ellipse of some 20 minute bulbs (Spencer, 1976: 320). The puparium is illustrated in Bladmineerders van Europa. Distribution in Great Britain and Ireland: Widespread in Britain including London (Hampstead), Surrey, Oxford (Spencer, 1972b: 67) and Warwickshire (Canley, Coleshill and Foleshill) (Robbins, 1991: 89). Leicestershire, Surrey and West Gloucestershire (NBN Atlas). Distribution elsewhere: Widespread in western and central Europe including Denmark, Norway, Sweden (Spencer, 1976: 320), The Netherlands (Bladmineerders van Europa), Belgium (Scheirs et al., 1994), Germany (Spencer, 1976: 562), Albania, Bulgaria, Czech Republic, European Turkey, French mainland, Italian mainland, Lithuania, Poland, Republic of Moldova, Romania, Slovakia and Spanish mainland (Martinez in Fauna Europaea). Range extending eastwards to the Kirghiz Republic of the [former] U.S.S.R. (Spencer, 1976: 320).